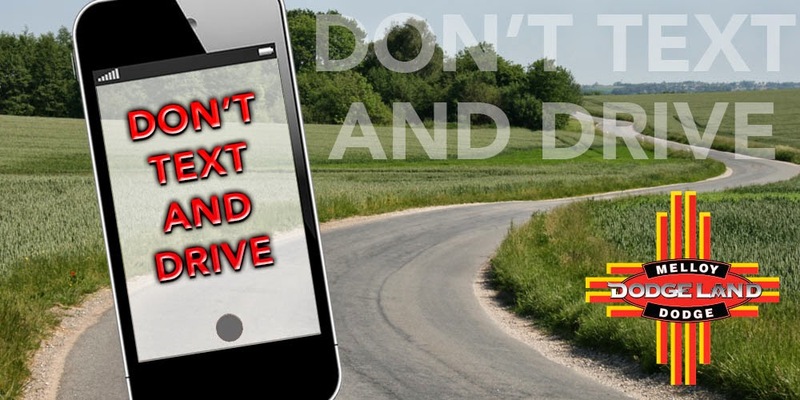 In the past year the State of New Mexico has adopted legislature against all texting and driving with the acceptance of Senate Bill 19, signed by Governor Martinez last March. With the bill just swinging into full effect this past summer, New Mexico drivers are still adjusting and making some improvements to their driving habits. Undoubtedly, SB 19 will help to decrease unnecessary accidents on our roadways, but just how dangerous IS texting and driving? What features on Dodge models like the Challenger, Dart, and Durango are available to assist you and keep you focused? And what are the new laws in New Mexico? Today, most Americans are accustomed to using cell phones from a very young age. In fact, more than 82 percent of our fellow Americans own cell phones- that’s a huge portion of our country! While the use of cell phones and other electronics is becoming more common, so is the phenomenon of distracted driving. While the term “distracted driving” includes many forms of risky driving habits, most people associate it with texting and driving. Did you know that some of the latest research indicates that as many as 23 percent of accidents in the United States involve cell phones? That’s around 1.3 million crashes! And it’s really no surprise when you consider that if you look down at your cell phone for five seconds (generally, the shortest amount of time it takes to send a text), you are, on average, clearing the length of a football field without ever seeing it. This is not only dangerous for you, but for all those around you! Never fear, we’re here to keep you safe! Most new Dodge models have lots of cool tech features, including the ability to sync your phone, delay texts, and play your favorite music, all hands free and voice activated so you can keep your eyes on the road. Now that we’ve covered just why texting and driving is bad for you and other drivers, bikers, and pedestrians, just what does the new bill outlaw and what are the punishments? The new laws prohibit texting while driving, texting while at a stop sign or traffic light, and pulling off the road to send and receive texts. Punishments for drivers generally come in the form of a $25 ticket for a first offence, with the tickets doubling to $50 for repeat offenders. In some places, like Santa Fe, the fines may be significantly higher. Keeping your wallet full is just one more reason to drive responsibly. The Melloy family has been selling cars in the Albuquerque community for more than 50 years, so you can trust that we are committed to your wellbeing. That’s why most of our models are equipped with state of the art safety designs. The Challenger, for instance, boasts more than 70 unique safety features including Dodge’s UConnect. UConnect is a function available on many new Dodge models that allows you to stay connected without compromising your ability to drive safely. Navigation, in-vehicle apps, Bluetooth, and options to hold calls and texts can be done just by speaking on UConnect. These features will allow you to cruise Albuquerque in safety, and with style. As the number one dealer of Dodge and RAM vehicles in the state, we are certain to have whatever features you are looking for in your new car. Interested in the safety features on the Challenger, Dart, or other models? Have questions about UConnect or want to try it out? Give our sales floor a call at (888) 760-4139.